Veteran-owned and operated Nine Line Apparel called out Nike’s latest ad campaign last week and has now taken their criticism to the printing press. Tyler Merritt, CEO and co-founder of Nine Line, appeared on Fox & Friends on Saturday where he called out Nike and NFL quarterback Colin Kaepernick, and released a shirt with the words “Just Stand,” Fox News reported. “They decided to take a stance. This is our stand,” Merritt said. 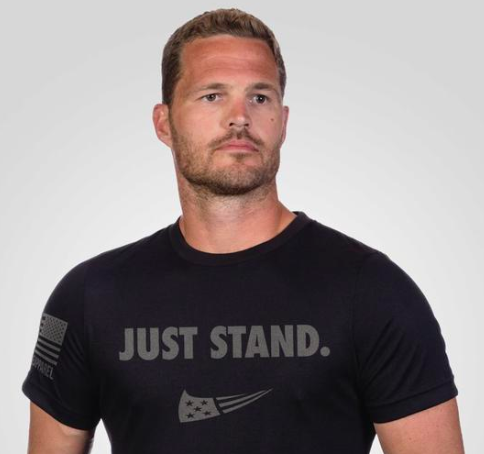 “As a veteran owned and operated company, we created the ‘Just Stand’ shirt to express our deeply rooted patriotic values – that the playing of the National Anthem should be a time of unification for the love of our country; a time of reflection to consider the men and women who have given their all in the fight for our freedoms,” Nine Line told American Military News on Tuesday. The advertisement drew widespread criticism over its implication that Kaepernick was the face of sacrifice. The word ‘sacrifice’ in the military members, it’s something severe,” Merritt said. Amid his worst performing season in 2016, Kaepernick opted out of his contract with the San Francisco 49ers, and began kneeling during the national anthem ahead of NFL games to protest police brutality and racism. He remains an unsigned free agent in the NFL, and recently signed a multi-year contract with Nike to include his own clothing line, a hefty advertising campaign with his image, and a contribution to his charity, Know Your Rights. Kaepernick’s success has led many to wonder why he was chosen as the face of sacrifice. Merritt believes Nike’s campaign didn’t consider those who might be offended by Kaepernick’s actions. Many find Kaepernick’s kneeling insulting and offensive, along with his once wearing socks depicting police as pigs. Nine Line posted a video to their Facebook page last week, featuring several examples of “just don’t do it,” a phrase they used in an accompanying hashtag. Merritt believes there are many other “iconic sports players who have done so much for their communities and military community” who would have been better examples than Kaepernick.